Growing up, there was never a shortage of home-cooked, heart-warming, comfort food on the table. Between my mom and my grandmother across the street, we always had a hot meal for supper every night and for lunch on the weekends. Strangely, though, as much as I was around all this food and women cooking it, I was never officially “taught” to cook by either of these women. That means that all of the cooking you see going on here has been self-taught with just an influence from my forewomen. Since I was never given the specifics on the art of country cooking (and let’s face it, that’s probably a good thing — who wants a mug of bacon grease in their fridge?!? ), I have had to sort out my own method for recreating those comforting favorites that I ate as a child. 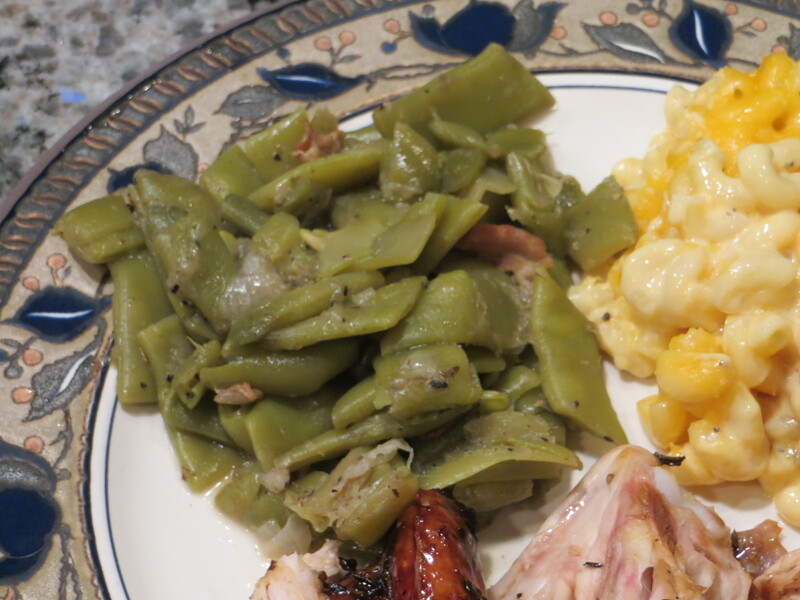 So without any further ado, an actual written recipe for creating a soul-satisfying “mess” of deep-South, homestyle green beans! 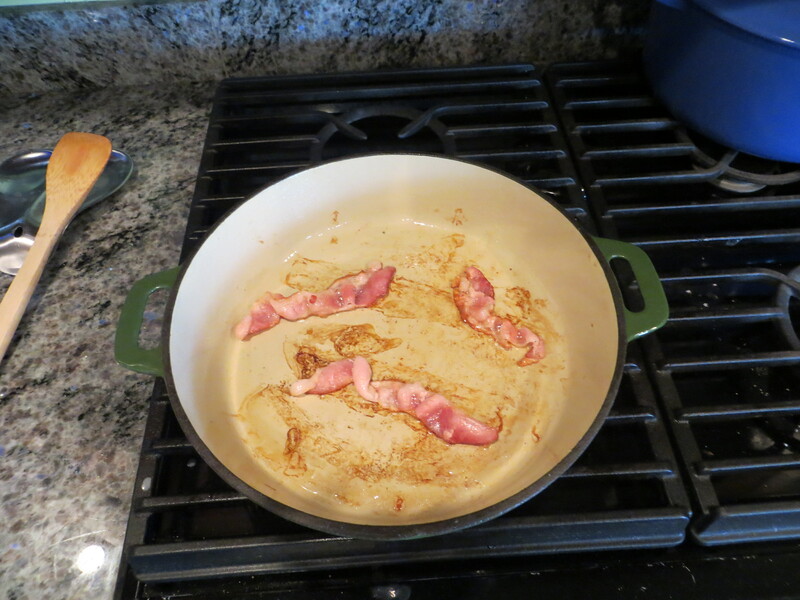 Cook bacon in large pan until some of the fat has rendered but do not cook until crisp. 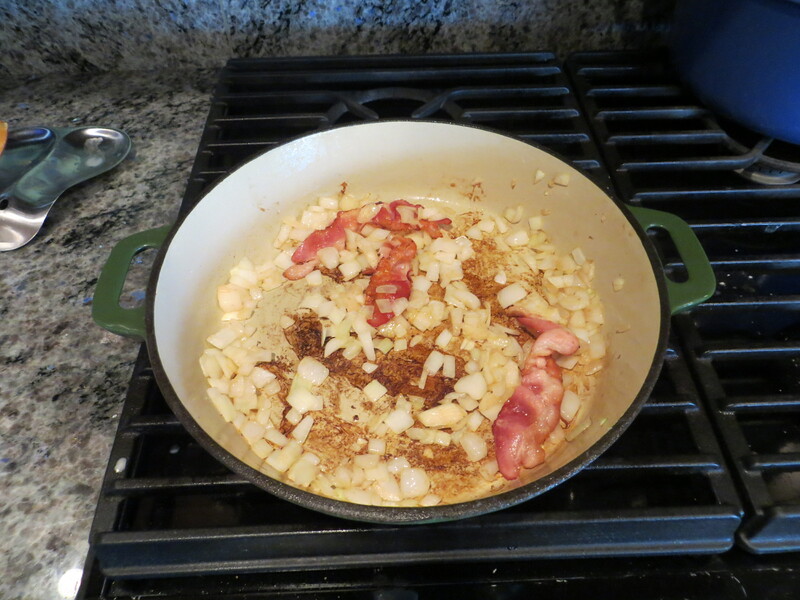 You just want there to be some grease in the bottom of the skillet to sauté the onion. Add the onions and saute until golden and tender. By now your pan probably has a nice coating of brown stuff stuck to the bottom so we will use the wine to deglaze it and scrape up all the savory bits. 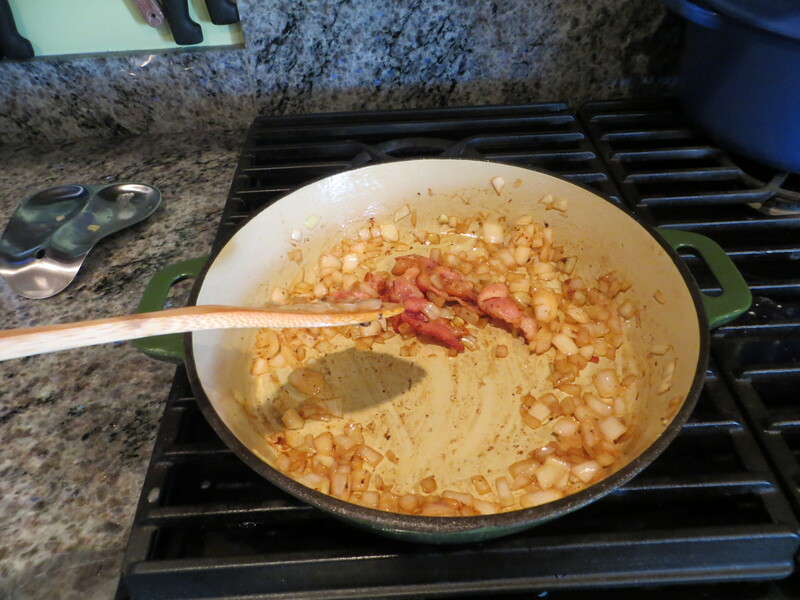 Push all the onions and bacon to one side of your pan. Pour in the wine and scrape the bottom of the pan to remove the stuck-on goodness. 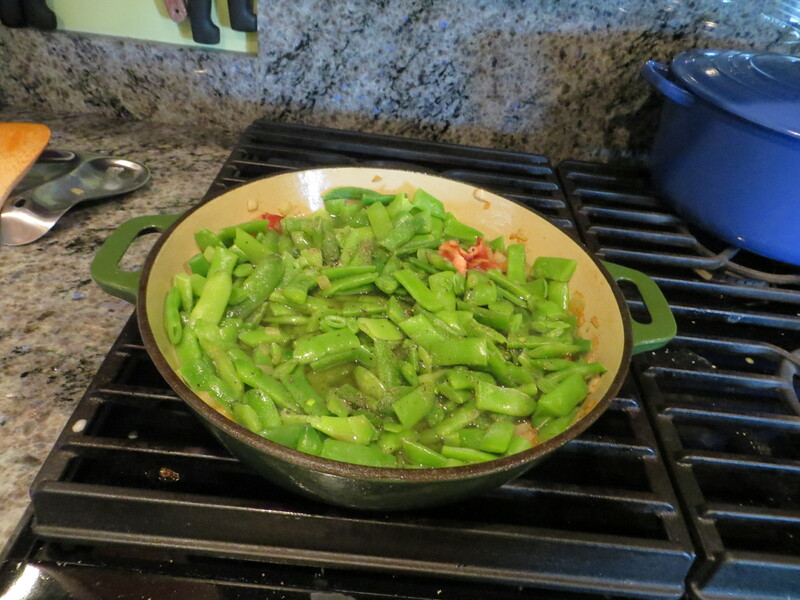 Once the bottom of the pan looks reasonably clean and all the wine has evaporated, add the green beans and enough water to cover. Stir in salt and pepper to taste. 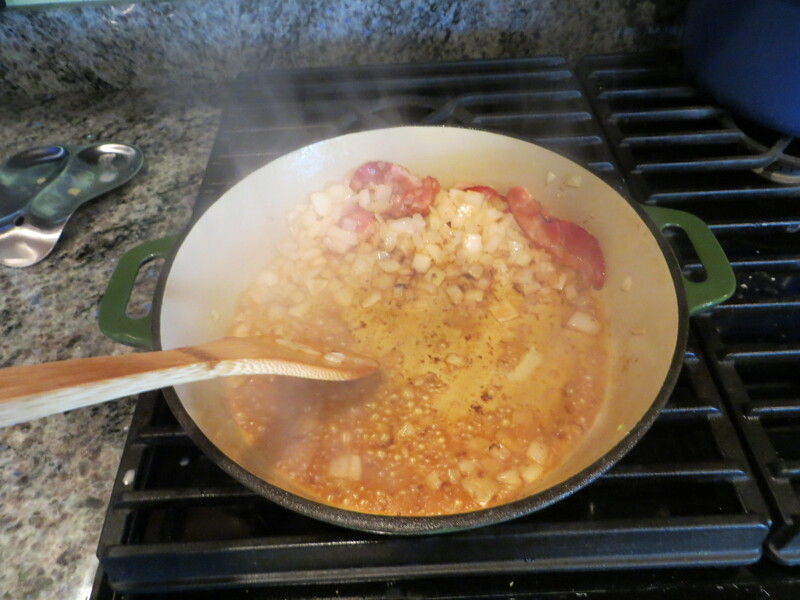 Bring to a boil, reduce to a simmer and cook uncovered until reduced, about 1 hour to 1 hour 30 minutes. You want your beans to be nice and soft. You can cover them for the last 20-30 minutes of cooking or add more liquid if needed. Enjoy! They look great! Another healthy option is to use smoked turkey pieces. It really gives them a good smokey flavor! I think I’ll try these this week! TFS!